This would make a lovely dish for Mother's Day or Father's Day. Any mom or dad would be thrilled to be served these scrumptious crepes with strawberries and cream. You will need a 8 to 10-inch crepe pan or an 8, 9, or 10-inch nonstick frying pan for making crepes in. In a large bowl, whip the 1 cup heavy cream, add to it the vanilla extract and the confectioners' sugar; mix well. Refrigerate until ready to use. Place the eggs in a large bowl. Beat in the sugar, milk, flour, and 2 tablespoons of the melted butter. Cover and let stand for 30 minutes. Heat a crepe pan or nonstick frying pan over moderate heat. Brush the bottom with some of the remaining melted butter. Pour 2 tablespoons of the crepe mixture into the pan and tilt to spread evenly and thinly. Cook for 2-3 minutes, until the top is just set and the bottom is golden brown. Turn over and cook other side for about 1 minute. Remove to a plate. Repeat until all of the mixture is used, making at least 6 crepes. 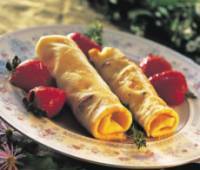 Stack the crepes, with a piece of parchment or waxed (greaseproof) paper between each crepe. Keep the whole plate covered with a clean dish towel. When all of the crepes are cooked, place 1 tablespoon of the vanilla-cream on the edge of each crepe. Roll up each cream filled crepe into a thin roll. Place 1 or 2 crepes on each dessert plate, and place a few strawberries around crepes. Drizzle each crepe with heavy cream or spoon a dollop of whipped cream over each crepe. Makes at least 6 crepes. Serve each person 1-2 crepes. It was fun to cook and great to eat. I have never tasted crepes before but I am going to make them very soon, they look delicious, so I hope they taste delicious too! This doesn't have the good kind of strawberry filling.....just strawberries and whipped cream is bland and personally I think that strawberries in sugar is probably a lot better. Nicer recipe's are on www.cooks.com. Check it out!